Recognizing the pose, the hand waving gestures, the anticipated intentions and the predicted behavior of the other traffic participants, the Cooperation and Communication Planning Unit (CCPU) develops an expectation-conforming, safe plan for the future motion of the AV and its interactions with the other TPs and its on-board user(s). The main objective for the past period was to develop the first working CCPU prototype to be integrated in the prototype CRF vehicle. Towards this purpose, the WP3 development teams have been working on the four CCPU modules, namely the Situation Matching, the Interaction Planning, the Trajectory Planning and the Safety Layer. 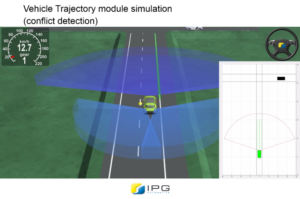 The modules’ input is based on the Perception and Situation Awareness layers output (work in progress in WP2): a ready-to-use perception platform (including six laser-scanners from Ibeo) has been installed by WP2 in the CRF experimental vehicle, which provides the detection, tracking and classification of other traffic participants at 360 degrees around the vehicle; in parallel, dedicated modules for the intention recognition are being developed by WP2. To allow a first integration with the CCPU components, a ROSBAG file (type of files that is decided to be used in WP3) generated from dummy data taking a scenario of the KITTI dataset was provided from WP2 to WP3 development team. 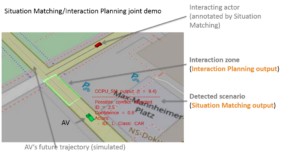 CCPU logic has been refined based on the initial concept described in D3.1: “Cooperation and Communication Planning Unit Concept” while first tests on simulated data have been performed to verify their functionality. 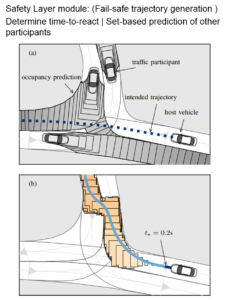 Furthermore, the WP 3 partners developed two data enablers to support the functionality of the Situation Matching and the Interaction Planning modules : the Traffic Scenarios (based on D1.2) and the Interactions Strategies (based on D4.1). The CCPU Situation Matching approach was successfully presented by interACT project partners in a well-attended webinar (second in a series) organized by CARTRE in 25th Sept. 2018, while short CCPU demos had been successfully presented during the project’s mid-term review at the end of 2018.